Considering the massive amount of websites that are using Google Analytics it is of course extremely important that the Google Analytics script is always available and responding well so that website visitors will have no problems loading it. We use Google Analytics ourselves here at Pingdom and think it’s a great tool for keeping track of our visitor traffic. Since we have included the GA script on both our main website and our blog, we were curious to see how well it performs and how reliable it is (uptime wise). To find out, we have monitored the accessibility of both the ga.js and urchin.js scripts around the clock using our monitoring network for the last three months. Websites include either of these scripts to gather statistics for Google Analytics. We call both the “GA script” for simplicity’s sake. We might as well say right away that during the last three months there has been extremely little downtime. This being Google, that may not be so surprising. There was some very minor downtime on November 26 when we could’t load the GA script (only a few minutes) but other than that there has been nothing to talk about. When looking at the load time data averaged over time, a clear trend emerges: the load time of the GA script differs quite a lot depending on the time of day. The graph below shows the script load times from all our monitoring locations combined, averaged over the entire 3-month period. The tests were performed from multiple locations in Europe and North America. Note that Central European Time (GMT +1) is used in the first two graphs below. This kind of uneven “load time pattern” is not uncommon for regular websites, but it’s interesting to see this happening with something run by Google. It becomes even more interesting if we break down the monitoring results between Europe and North America. 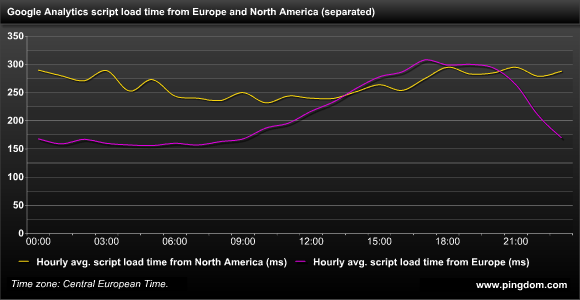 As you can see, loading the GA script from North America is overall a bit slower than loading it from Europe. On the other hand, while the European load times are significantly faster on average than the North American ones, the performance is much more uneven over the course of the day. If you look at the curve for North America, the load time for the GA script from North America is also faster when traffic is naturally lower, at night time. To make this easier to see, here is the North America curve again, this time adjusted to US Eastern Standard Time. The difference is not as extreme as in Europe, but it’s there. Does Google need to scale up Google Analytics? The data we have uncovered seems to indicate that even with Google’s massive infrastructure at its back, access to the Google Analytics script is affected by the ebb and flow of varying website traffic. It could be a sign that Google should start thinking about scaling up the part(s) of its infrastructure that hosts the Google Analytics script. How does this affect site owners? There is no real reason to worry about the load time performance of Google Analytics as it is now, but as with any external scripts included on a website, it is a good idea to make sure that the web page doesn’t try to load the external scripts the first thing it does. Instead, load external scripts (such as GA) after loading the content of the web page; that way the web page will not freeze as a blank or almost empty page in case a script is slow to load (or doesn’t load at all). We have shown that European web surfers have potentially faster access to the GA scripts, but the performance today seems to be hampered somewhat during peak traffic hours. We don’t know exactly how Google is serving these scripts (though we assume they are using some form of CDN), but the difference is a fact. European web surfers will load the GA scripts almost twice as slow during the afternoon and evening (European time) compared to the rest of the day. North American users will also see a difference, but it will not be as pronounced. Note that these are hourly averages measured over a long time. There will be variations from day to day and test to test (some load attempts will be faster, some slower). The files that we loaded were www.google-analytics.com/urchin.js and www.google-analytics.com/ga.js. This would be the equivalent of a website visitor loading the script in his browser when accessing a website that uses Google Analytics. Tests were performed once a minute over a 3-month period. Would be nice to see similar statistics for Omniture scripts. That’s very interesting. I wonder if Google is aware of this or not? Yea, I noticed this couple of times on my blog, loading slowly at certain times of the day and hence I removed the code completely. It’s pretty annoying when a web page is too slow to load. The problems led to many websites placing the script within a “secure HTML-tags”. Something that should always be done if you wanna “go free”. It will be nice if we can have some loading time information from Asia. there are a few points I’d like to raise after reading this post. 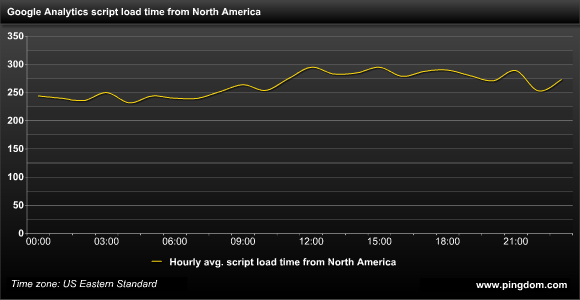 First of all, load times really apply to initial script load. Subsequent page views use a cached version of the script. Secondly, Google Analytics tracking code should be placed right before the HTML tag to prevent slow loading times. Essentially, if you’re afraid that GA will slow your page down, you’re not tagging your pages right to begin with. Thirdly, to avoid higher loading times, the ga.js script can be self-hosted on one’s webserver, with a cron job to download a fresh copy every week or so. Finally, if you still use urchin.js, time to upgrade to ga.js – urchin.js is no longer maintained and will eventually be decommissioned this summer. So as you can see, there is more than one view point on this issue. As far as I’m concerned, I have never seen high(er) loading times impact actual website measurement. 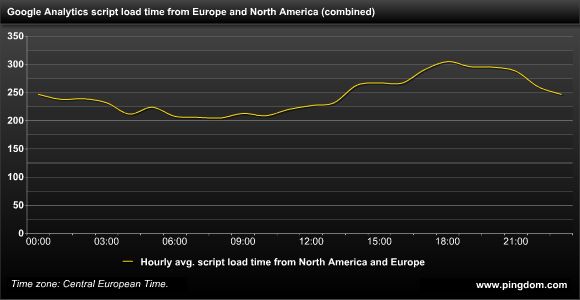 So Europe loads GA faster than North America most of the day? At it’s worst, the Europe code loads at the same speed as North America. Interesting data, but I don’t think we need to lose sleep over Google’s server capacity. I can accept 300ms for the value that Google Analytics provides. Doy have any updated stats for GA performance variations?